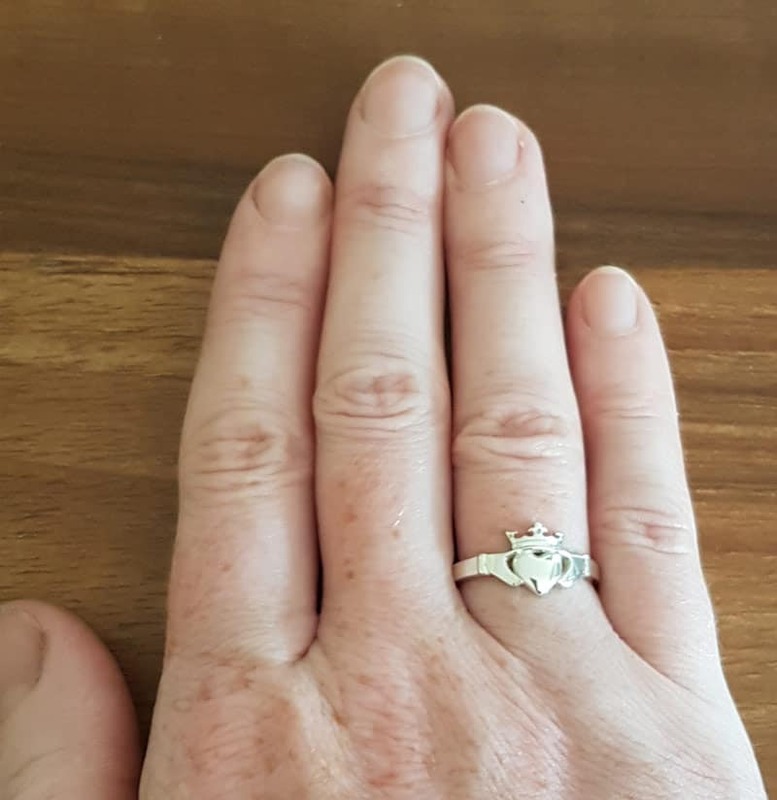 There are many pieces of traditional Irish jewellery including the Celtic knot bands and crosses which I adore but there has always been a special place in my heart for the Claddagh Ring. The Claddagh Ring is a beautiful piece of jewellery showing great craftsmanship and has a lineage going back over 300 years. It is perhaps one of the most recognizable Irish images after the Harp and Shamrock. It has maintained its popularity as a piece of Jewellery for generations at home in Ireland and in the wider diaspora. The simple marriage of the heart, hands and crown have insured the design is timeless. The ring and its symbol have a rich history and deep meaning from its origins in the Claddagh fishing village in Galway city. The ring features two hands holding a crown-wearing heart. As far as history tells us currently, the ring was created in Claddagh, an Irish fishing village located in Galway city in the mid to late seventeenth century. The tale or so it goes behind the ring starts with a young silversmith, Richard Joyce , separated from his beloved and while working for his master, yearned for her and hoped she would wait for his return one day. It is told that he stole iotas of gold from his master which he crafted together to make a ring. The heart represented his love, the hands, his friendship and finally the crown, his loyalty. After many years of indentured servitude he was released and returned to Claddagh. To his delight, on his return, he found that his love had indeed waited for him. He gifted her the ring, and in so his loyalty, his friendship and his love. 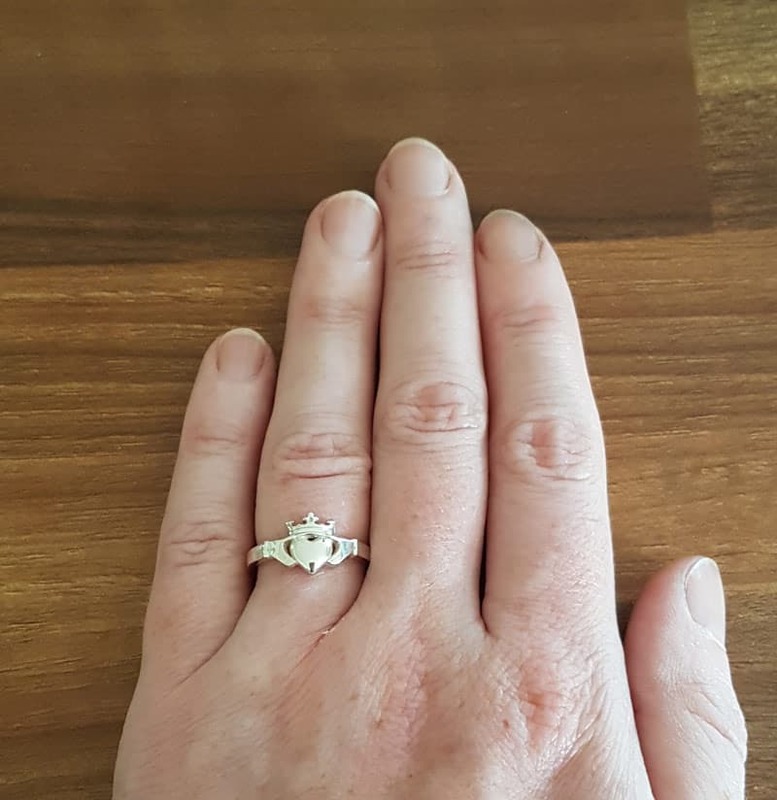 Traditionally, the Claddagh ring is passed to the eldest daughter as a gift from her mother and is a family heirloom for generations. In some cases, the ring was the only savings or fortune of a family and as such, the ring was the daughter’s only inheritance. Because of this, the ring became used as an engagement ring. The ring gained more fame and widespread appeal during the Victorian era especially amongst the Irish diaspora. Claddagh rings confused people initially when they started showing up in America and Canada. They migrated with their owners over the years who traveled overseas in search of better lives. And since the story of the Irish diaspora in North America is filled with hardships and a longing for home it’s no surprise that the ring has gained huge popularity there. With the long history of emigration to North America and Australia from Ireland the ring now has worldwide appeal and is almost instantly recognizable due to its unique design. Just like the tale of the ring’s origins, the rings stayed with lovers as they became separated through hardships. The tale of Richard Joyce is in itself very romantic and telling of the times when it originated. The symbolism is rich and beautiful, and so it is easy to understand why people decide to buy or have made these rings for their lovers, their wives, their husbands and their children. Other people wear the ring as a signifier of their Celtic history or their love of the origins of the story or tradition. Whatever the reason for the wearer it is deep and meaningful. However, there are certain ways in which the wearer can wear the ring to portray their relationship status to others. When worn on the right hand, when the heart’s point is facing the fingertips, it represents the person is single and possibly looking for love. If you are not married and want to show you are single and available to give your love to another, wear the ring on your right hand with the heart’s point facing your fingertips to symbolize this. When worn on the right hand, the heart’s point toward the wrist it symbolizes that the wearer is in a relationship. So If you are dating someone, wear the ring on the ring finger of your right hand with the heart’s point facing you, this shows you are not married, but you are with another and not looking for romance. When worn on the left hand, the heart’s point toward the fingertips it traditionally symbolizes that the wearer is engaged. So if you are engaged and wanting to let the world know, wear the ring on your left hand with the heart’s point facing towards your fingertips – this shows people that you have found the person you will spend the rest of your life with, but have yet to say your vows. When you are married you wear the ring pointed inwards to signify your heart is taken. The ring can still be worn when one is married however the wearer often switch it back to the right hand with the heart pointing in. These are not strict rules. 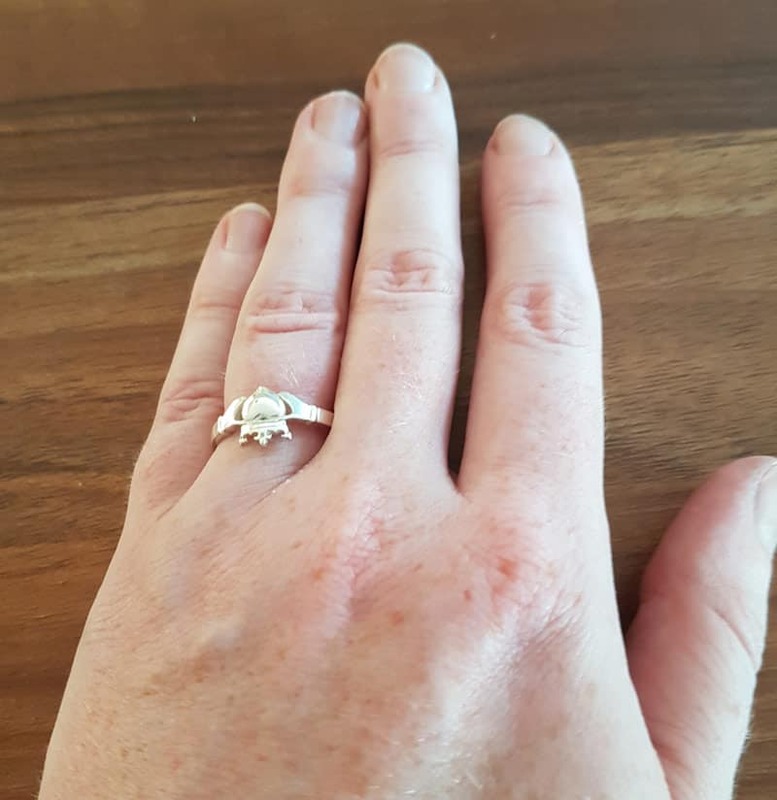 Many people do not wear the ring to show their romantic status, but for tradition and to connect to their Irish heritage. So it’s very normal to see poeple wearing the ring on either hand and in various positions but there’s always the chance that they are keeping people guessing! Some people want to wear the ring but still believe in the tradition of the rings meaning being linked to the direction and hand it is worn, so choose to wear it on a chain as a necklace; this is also an option for other people that do not wish to wear it as a ring. Attachments to charm bracelets or pocket charms are also ways in which the Claddagh ring is worn and have become increasingly popular. 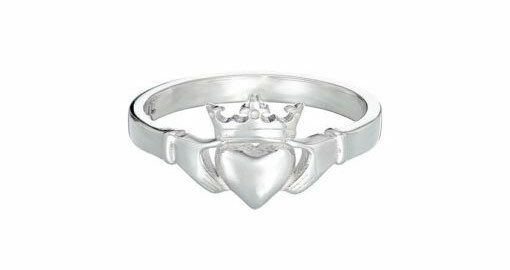 The Claddagh Ring for me is one of the best jewellery designs of all times. It is only when you try to redesign such a potent symbol that you realize how important a design it really is. For my first (as I predict that I’ll have a few more!) interpretation of the design, I’ve used the High Kings of Ireland Crown that featured on the Coat of Arms of Ireland around the time of Brian Boru in place of the general crown that others use. For me, this adds historical significance to the design and provides a direct link to the important history and heritage of Ireland. The design is available as a ring and in a dainty and medium-sized pendant. 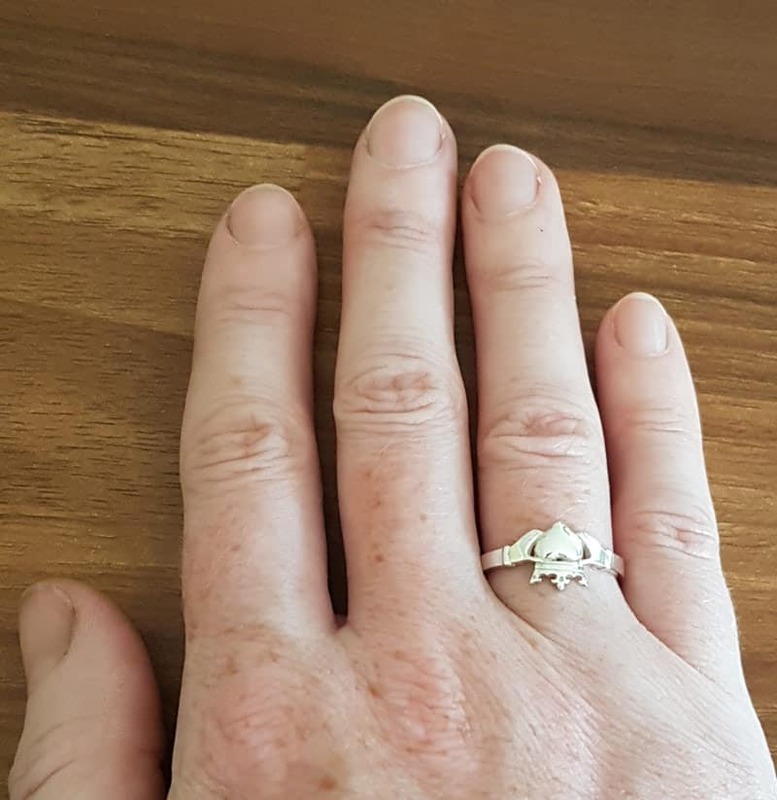 This entry was posted in Heritage and tagged claddagh, Ireland, irish design, Irish jewellery.